The Chocolate Chip reigns supreme as American’s favorite cookies. Trying doing a Google search for chocolate chip recipe. You wull be overwhelmed with recipes. So do we really need another chocolate chip cookie recipe? You bet your bottom dollar that we do! This isn’t an ordinary chocolate chip cookie recipe. Oh no. These are the Oatiest – Alton Brown said it so now it’s word – cookies of all time. What Makes Them the Oatiest? Alton Brown had a great idea. 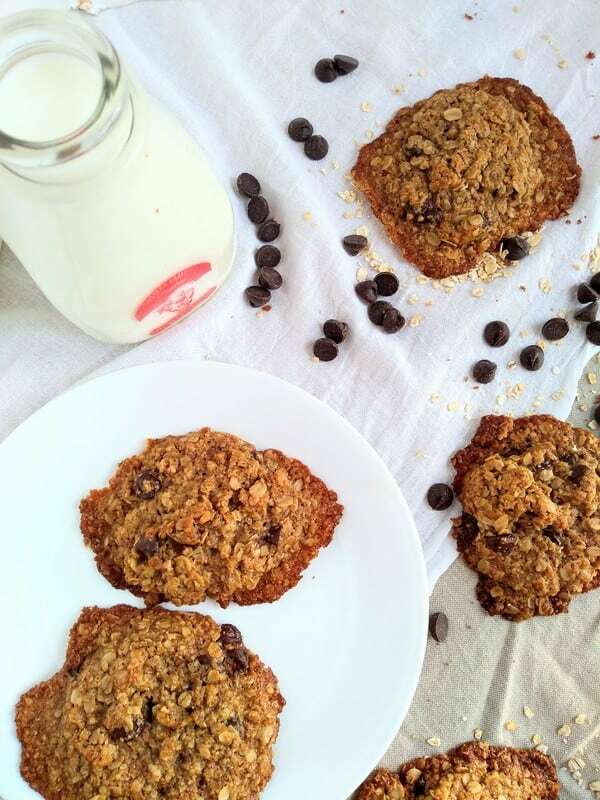 Replace the wheat flour with oat flour when making oatmeal cookies. They are oatmeal cookies right, so why is there wheat flour in basically every recipe? 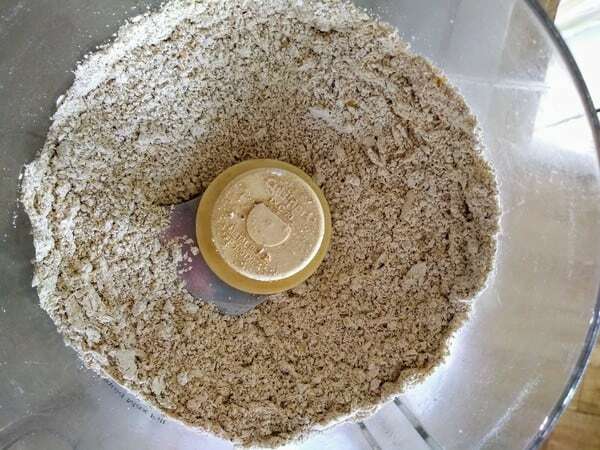 The oat flour is made by turning toasted rolled oats into a powder that looks like whole wheat flour. Here are my notes from this recipe. 1. When I first tried this recipe I actually didn’t own a food processor. yet. That sounds crazy to me now. Using the food processor to turn rolled oats into oat flour is super easy. I don’t see any reason really to buy already made oat flour when you can do it yourself for cheaper. And you can toast the oats before processing for even more flavor. So I didn’t know if I could make the “oat flour”. I tried a blender instead. And it still worked. It was a little more work and I had to be careful not to overheat the motor of the blender. I can attest it does work better in a food processor, but you can do a blender in a pinch. 2. For the dark brown sugar the recipe calls for, I like to make my own brown sugar with cane sugar and molasses. I wrote about how to do this in a previous blog post. 3. Alton’s recipe calls for raisins that he soaked in rum. I of course reached for a bag of chocolate chips instead. You’re welcome! 4. I recommend using a disher to form the cookies. It makes your life so much easier. Alton recommends using an 1 1/2 inch disher, mine is more like 2 inches. So I ended up with less,, but bigger cookies. That’s fine by me. 5. If you think your cookies are spreading too thin for your liking, you can chill the dough for at least a half hour before baking. This will harden the butter and the cookies won’t spread as much. 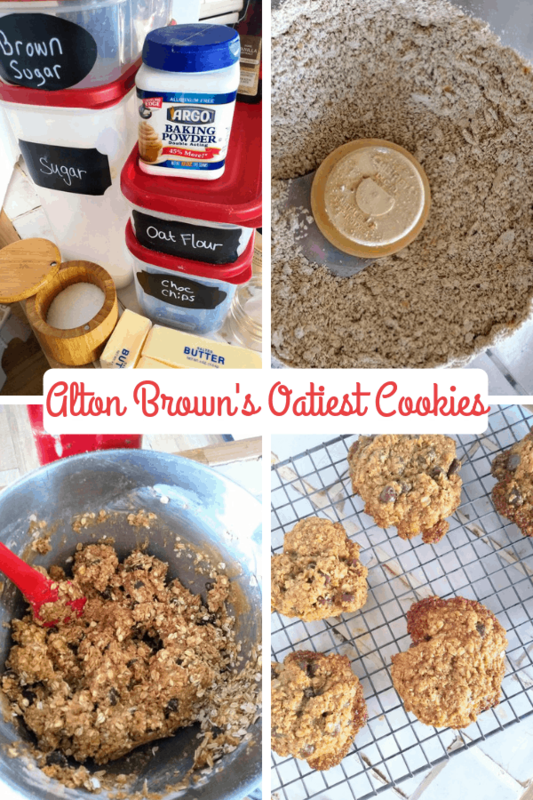 Alton promised these would be the “Oatiest” oatmeal cookies of all time. I found that to be true, the volume on the oat flavor was turned up several notches. 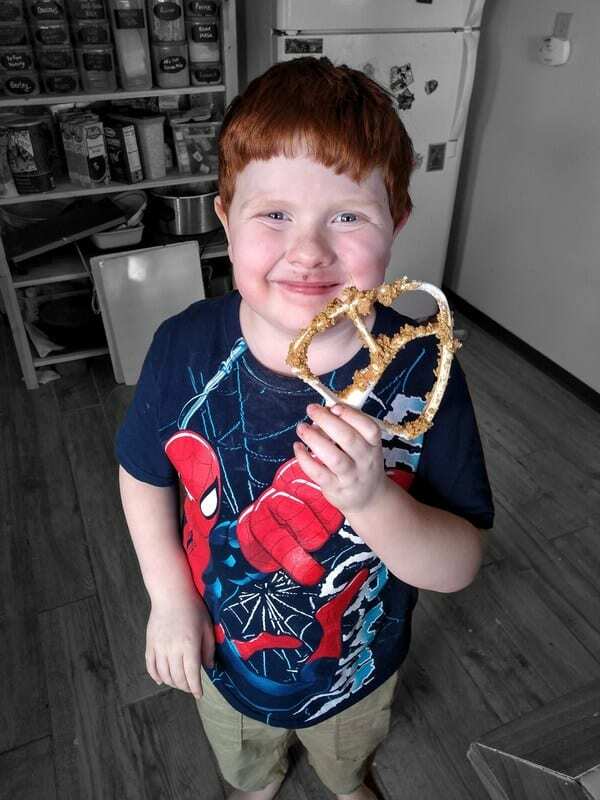 My son really loves helping to make cookies or any sweet treats. Google also loves to turn pictures of my son into “Color Pop” pictures. It must be the red hair. Are These Cookies Gluten Free? It depends on the oats you use. If you have someone who is really sensitive to gluten, then you will want to make sure that your oats are labeled s being certified gluten free. Often times oats are processed on shared equipment with wheat products, so cross contamination is a real possibility. 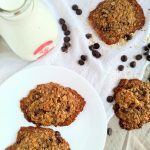 The most oat flavor ever packed into a chocolate chip cookie. Recipe developed by Alton Brown. Instructions written in my own words. Spread the oats onto a half sheet pan. Bake until the oats start to smell and are lightly toasted. No more than 20 minutes. Keep a careful eye on them. Remove the oats from the oven. Allow to cool enough so you could handle them. Add 8 ounces of the oats to your food processor. Process them until they are the consistency of flour. To the food processor bowl add the cinnamon, baking powder, and salt. Pulse a few times to combine. In the bowl of your stand mixer add the butter and sugar. Beat until well combined and lighter in color, around 3 minutes. Scrap the side of the bowl. Then mix in the egg and vanilla extract until combined. Add the ffour mixture and combine on slow so the flour doesn’t go everywhere. Remove the bowl. Stir in the remaining whole oats you toasted along with the chocolate chips. Using a 2-inch disher, scoop the cookie dough out and onto a parchment lined half sheet pan. Make sure to a leave a couple inches between cookies. Don’t overcrowd the pan. Bake the cookies for 12 to 15 minutes or until they are beginning to brown around the edges. I recommend rotating the pan(s) halfway through the bake time so even baking. Disclaimer: This post includes affiliate links. This means that at no additional cost to you, I will earn a commission if you click through and make a purchase. These are products and services I recommend because I use or trust them. Cookies will be used to track the affiliate links you click. Previous Post: « Can You Roast/Bake Any Type of Squash Seeds?